DNA 'Barcode' To Help Nab Illegal Wildlife Traders Researchers at the American Museum of Natural History in New York City have identified a specific section of DNA that seems to be unique to each species. Using this "barcode," they can evaluate meat and skin samples to determine if they came from an endangered species. Leather products found at a crafts market in Brazzaville, Congo. 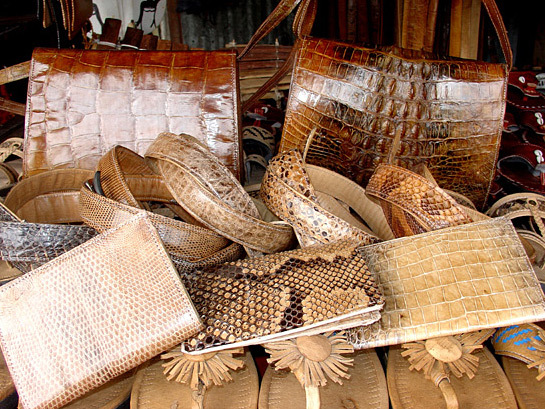 They may have originated from Mali, as similar products were found in the shop of Malian leather workers who illegally ship in Nile crocodile and other skins to Congo. A new tool has emerged that could give investigators around the world a way to stop the illegal trade in threatened and endangered species. The idea is that customs agents can send samples of items made from animal products — like crocodile skin boots or antelope hide bags — to a DNA analysis lab where researchers can determine exactly what species the product or meat is from. This kind of analysis is now possible because researchers at the American Museum of Natural History (AMNH) in New York City have identified a specific section of DNA that is unique to each species. By analyzing this "barcode of life," they can determine if the skin is from an endangered antelope or one that's allowed to be hunted. The "Barcode of Life Data System" resides in seven steel canisters stored in the basement of the museum. They look like six-foot-tall thermoses and they're filled with liquid nitrogen. 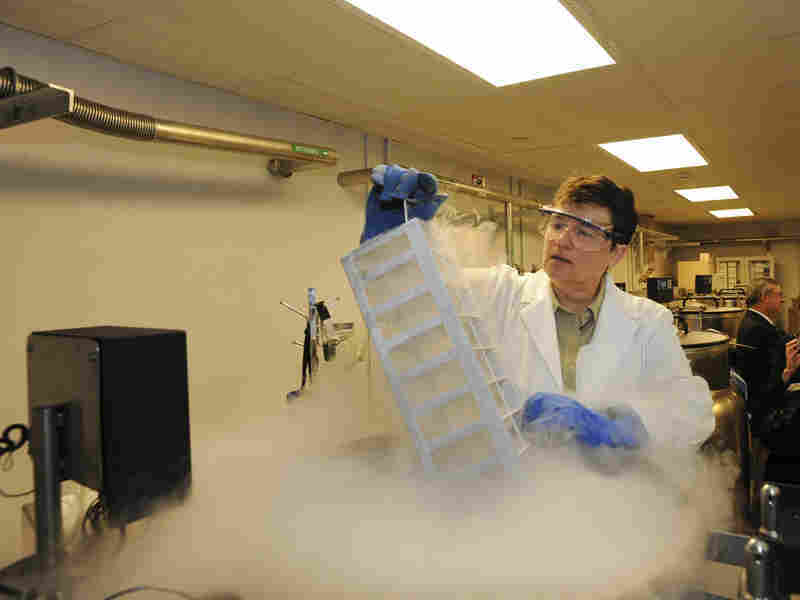 "We have about 70,000 samples right now," says Julie Feinstein, the collections manager at the AMNH. "We have a continuous influx." The "influx" consists of everything from butterfly wings to whale blubber — tissue from field biologists and museum curators who send in these samples to be stored and, eventually, have their DNA analyzed. "We get DNA from feathers ... blood samples, skin samples, or for smaller animals we could have the whole organism," says George Amato, an evolutionary biologist who helps oversee the DNA library at the museum. Amato and his fellow biologists are trying to curb the illegal wildlife trade, especially bushmeat — meat from antelopes, monkeys, or other wildlife that may be consumed locally but is banned from international trade. In the new project, they're also targeting illegal wildlife products like shoes or handbags made from protected reptiles. The trade has become a multi-billion-dollar business. Julie Feinstein, collection manager of frozen tissue lab at AMNH, removes a rack of samples from one of the liquid nitrogen-cooled storage vats. She's wearing special gloves so that, as she puts it, she doesn't stay attached to the vat. Amato is analyzing the animal samples and identifying a particular section of DNA that is unique to every species of animal or even insect. For example, a duiker antelope would have a sequence that is unique only to duikers, but different from other antelopes. A Nile crocodile's sequence would differ from other kinds of crocs. Amato calls this revealing section of DNA a species "barcode." Here's how the barcode could work: Let's say you're a customs agent who's found a hunk of meat in a suitcase. You don't know if it's duiker antelope or hamburger, let alone an ordinary kind of antelope that's not protected by international law. So you send a piece of it to Amato. Amato compares that DNA to the DNA in his library and knows right away what species it comes from — and whether the meat is legal. The project is still in the testing stage, says Mitch Eaton, a biologist with the U.S. Geological Survey near Washington D.C., who helped conceive of the project. He spent years documenting the bushmeat trade in Africa. "These regions are becoming more and more global," he says. "It's not just local hunting any more. The increase in pressure on these forests for economic and commercial purposes is growing very quickly." 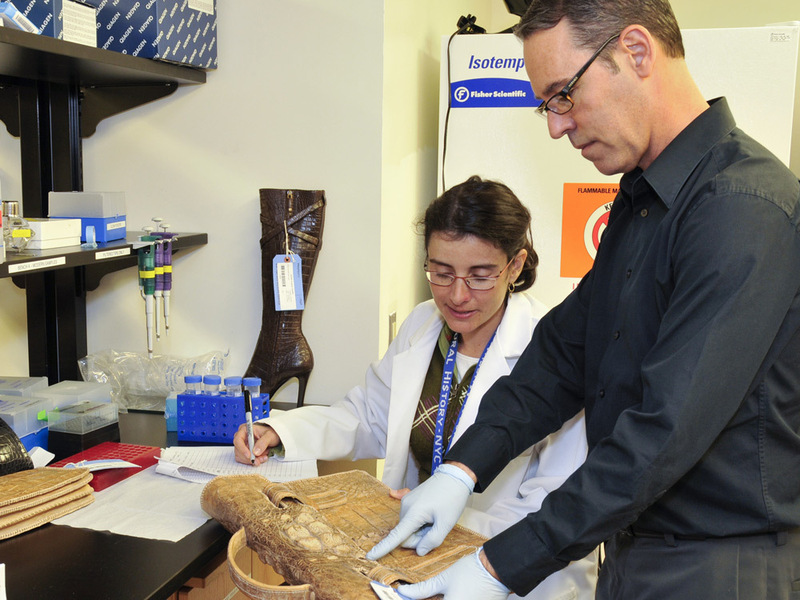 George Amato, an evolutionary biologist who helps oversee the DNA library, inspects a crocodile skin briefcase. Even after the skin has been processed, the bumps contain bits of bone the lab uses to extract DNA. Eaton says wildlife investigators need a tool like the DNA barcode because much of what's traded is unrecognizable. "These things are being transported as refined products or pieces of wildlife and they have no ability to tell what species it actually is," he says, "They would be able to use this technology and it takes all the guesswork out." At the museum's lab in New York, Amato pulls down a box full of leather goods confiscated by the federal Fish and Wildlife Service. "This pair of boots, you can see where we've removed one of the scales to do the isolation," he says. "These boots, I think we looked online and they sold for $4,000 a pair. I think they were supposed to be made out of Nile crocodile." In fact, his analysis proved they were Nile crocodile, and illegally traded. Amato's team has just described its barcode technique in the journal Conservation Genetics. Amato says they hope to turn the technique into a tool that investigators can use worldwide. So far, they've already identified illegal imports of whale, dolphin, crocodile and smoked monkey.